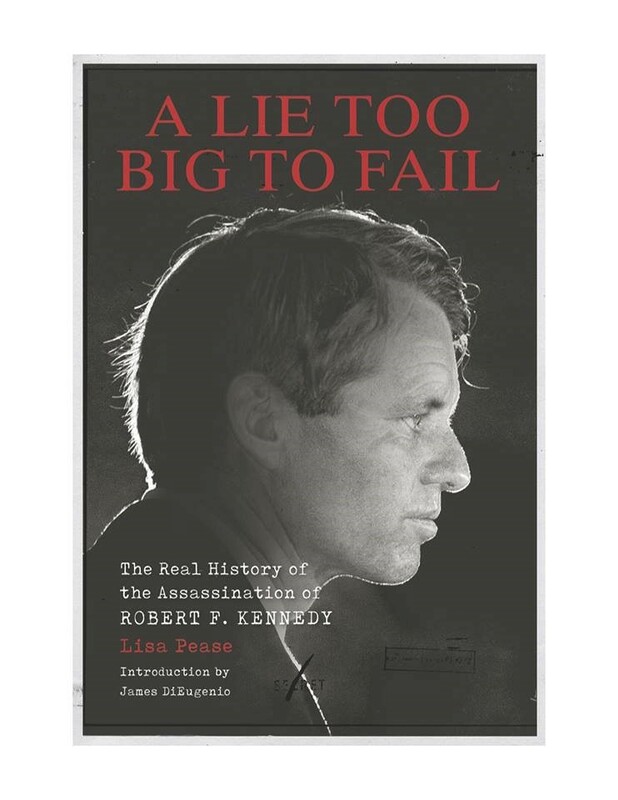 Real History Blog: Preview of the cover of my new book, A Lie Too Big to Fail! Preview of the cover of my new book, A Lie Too Big to Fail! As many of you know, I've been researching the assassinations of the 1960s for more than 25 years now. I've had a particular interest in the assassination of Robert Kennedy. I started and stopped this book a couple of times over the last ten years, but got really serious about writing it over the last three and a half. Here is a preview of the cover. Jim DiEugenio was kind enough to write a wonderful introduction as well. I can't wait to talk about what's in the book. But I'm sitting on mega secrets for now. Can't wait to knock your socks off though! The book will be out in September and should show up in Amazon.com and other outlets in April. Congratulations on this tremendous achievement, Lisa Pease! I'm very eager to read the book, though I know it will stir up sorrow and anger. You're a national treasure. Thank you for your work Lisa and good luck with your book. RIP Bobby . I'm really looking forward to this book. You might not be able to reveal this yet, but is it going to delve further into William Joseph Bryan, the probable hypno-programmer of Sirhan? Last year, I read Dave McGowan's book _Programmed to Kill_, which covers (among other things) how Albert DeSalvo was likely framed for the Boston Strangler murders with the help of Dr. Bryan to feed him the "confessions". You also brought this up briefly in your Rubik's Cube article. And of course, Sirhan oddly made reference to DeSalvo. That connection between the RFK case and the world of serial killers always fascinated me. Thank you so much, Jamey. Very kind. Thanks, FB and George K as well. George - in short, yes. ;-) I have some new information that should be of interest and more depth on some of the info already out there. But there is so much more to the story!! Dewayne A Wolfer was the instructor of a criminalistics class I took while completing requirements for a BS in Criminal Justice at Cal State University in 1973-1974. During the course of the semester, Wolfer was questioned by a student about his role in the RFK investigation, and the "two gun theory". His reaction was interesting. He stated that the evidence presented to the Grand Jury and during the trial phase did not support the existence of a second gun, but if he was being asked for his opinion, a second gun could have been involved. This was a few years after he retired from LAPD, so his pension wasn't at risk. There was no doubt that Sirhan was involved, but doubt exists if he acted alone. The bigger question was who had the power and authority to shut down the investigation and manipulate the evidence. There you will find the sponsor. Personally, I don't want to know. I have been following the JFK case since about 1980. I have a lot more JFK books then I do RFK books. I have maybe six or seven RFK books. Robert Houghton, Bill Turner and Jon Christian, Shane O'Sullivan, and maybe three others. away from it. I have a theory about who the girl in the Polka Dot dress was, but will save it for another time. Maybe I will find who she was in your book?"